Pockets stitched with binding and finished with metal tabs at the corners, to match your leatherette or cafe style menu covers. PLEASE NOTE: The stitched edge add-on pages are NOT designed to fit into the Economy Cafe Style Menu Covers as the binding width is slightly different than the Deluxe Cafe Style Menu Covers. 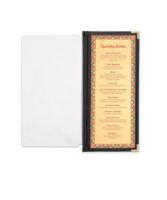 Half Width Menu Pocket with Leatherette Binding - 4.25 in. x 11 in. 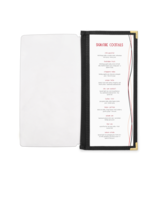 Half Width Menu Pocket with Leatherette Binding - 4.25 in. x 14 in. 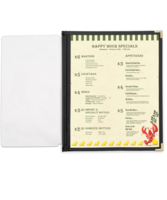 Half Width Menu Pocket with Fabric Binding - 4.25 in. x 11 in. 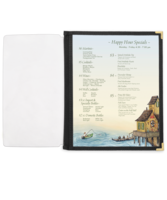 Half Width Menu Pocket with Fabric Binding - 4.25 in. x 14 in. Full Width Pocket with Leatherette Binding - 8.5 in. x 11 in. Full Width Pocket with Leatherette Binding - 8.5 in. x 14 in. Full Width Pocket with Fabric Binding - 8.5 in. x 11 in. Full Width Pocket with Fabric Binding - 8.5 in. x 14 in. 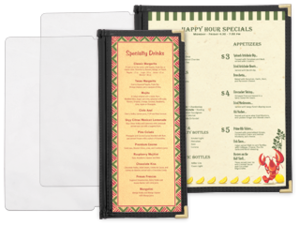 Add-a-page clear pockets with edging and corners to match sewn edge or leatherette menu covers. Shop online with the Menu Shoppe today.